Due to parking regulations in most Boroughs we have to leave the organisation of parking for our vehicles to the customer. This normally only entails a call to your local council to arrange parking dispensation which some councils do charge for. Our vehicles normally require 3 parking bays or 15 metres of parking space. Most councils require 1-2 weeks notice to book dispensations. Please note that visitors permits are not valid for removal trucks and proper dispensation needs to be organised. We can organise parking for our vehicles on red routes and yellow lines. Don’t forget to let us know about the access and parking at your new property so we are prepared for any problems. If you are moving to a property with a long walk or lots of stairs we need to know so that we can make sure we have the right equipment and men on the day. Remember removal trucks are large vehicles and need room to manoeuvre. Our vehicles can be 12 metres(40 foot) long, 4.3 Metres (13’6″ high) and 2.5 metres (8′ 2″) wide and 18 tons in weight. Please let us know if there are width, height or weight limits to get to your new property to avoid any surprises on the day. Smaller vans can follow the larger ones to tranship your effects to tight access properties if needed. We prefer if you used our packing boxes and materials if you do decide to pack yourself as we use uniform sized boxes that are easier to pack and they are double walled, strong boxes designed to be stacked up without crumpling. 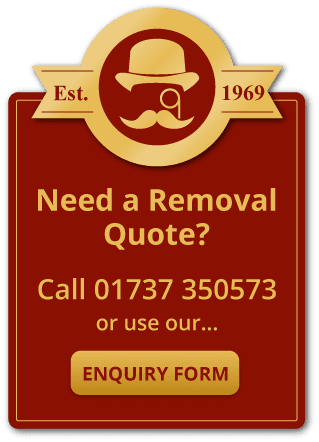 We supply all of the packing materials required for your move within our costings which we can deliver to your door and you can keep them as long as needed after the move. The only thing we ask is that you look after them and keep them safe when finished with them. So we can collect them and re-use them once you have finished with them, not only to be efficient but to reduce the impact on the environment. If you are moving more than 20 miles from our depot the cartons are yours and you can dispose of them as you see fit. Before we arrive to carry out a packing service it is ideal if you make sure you have everything to hand that you are likely to need otherwise it could get packed up and disappear for a couple of days before being found again. Our advice is to either put everything you need in your car or make space either on your bed or a kitchen work service and make sure the packers know not to touch it. Things you may need left out include car keys, paper work/documents, baby bits, something to eat and drink with that nights toiletries, alarm clock, mobile phones, glasses, medicines. Oh and a change of clothes! Remember our packers are experienced and can be quicker than you think! We also normally don’t pack the kettle as there is nothing like a nice hot cup of tea to wash away the stresses of a move, also moving is thirsty work!! Do fill the boxes to the top. Do use plenty of wrapping. Do ask for more materials if you run out. Do use our smaller book cartons to pack books. They are the right size to fill with books without being too heavy. Dont use single walled cartons/crisp boxes as they are not strong enough. Dont put too many heavy things in one large box as it could be too heavy to lift. Again as with packing please remember to make sure you have everything you need so it doesn’t get taken to storage. Our storage is not a self store so due to insurance, health and safety regulations we cannot allow you to come in to the storage. Not only that, but your effects are packed tightly into containers making access difficult. We can access your belongings for you, but this will carry a charge. In our experience the biggest problem is when people forget to leave out their passports, driving licences or other important documents. Please do not forget to give us your contact details! It is very important that you let us have your contact address and telephone numbers. Please note we cannot store flammables, gas bottles or perishable food items. Our insurance also does not cover jewellery or cash. Please ensure these are safely on your person. We are a friendly family firm and we love children and pets, but moving home and heavy furniture with large trucks can be hazardous and we ask if pets could be put somewhere out of the way so that we do not trip over them or so they do not escape. Also if children could be kept out of harms way whilst the men are carrying heavy items and when our vehicles are manoeuvring. They are more than welcome to kick a ball around with them while they are on their tea break! We did do a move and the customer could not find her cat. She was most distressed until when the men were carrying in a chest of draws and out shot the cat. The poor cat was not put somewhere safe and had become scared and sort refuge in the back of the chest of draws. It did a 200 mile journey in the chest in middle of one our trucks full of furniture! It survived and settled into its new home!